A photograph of a coherent two dimensional profilometer (2DP) - a device Coherent Inc. will use in the process of the TMT primary mirror polishing. Marking a major production milestone, TMT has entered into a contract with Coherent Inc., one of the world’s leading providers of lasers and laser-based technology for scientific, commercial and industrial customers, to polish its U.S. manufactured primary mirrors (M1) segments. 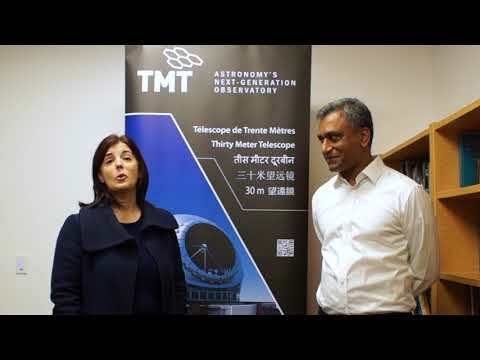 TMT, with its thirty-meter diameter primary mirror, and a collecting area greater than all other optical telescopes on Maunakea combined, is the largest optical/near-infrared telescope planned for the northern hemisphere. Under the terms of the contract, Coherent will precisely contour and polish the optical surfaces of 230 mirror segments to the accuracy of less than 1/50th of the width of a human hair. The remaining segments, including spare segments, are being provided by TMT’s international partners Japan, China and India. Coherent will use a unique “Stressed Mirror Polishing” (SMP) technique, a process refined jointly with TMT, for the production of the polished mirror segments. The Stressed Mirror Polishing uses specially designed fixtures that apply precise forces to the mirrors during their fabrication. The Ohara ClearCeram™ blank is warped into an aspheric shape, then accurately polished into a smooth spherical surface using a conventional polishing technique. The forces are released after polishing, and the mirror relaxes into the desired aspheric shape. SMP methodology was originally developed for the construction of the Keck telescope primary mirror, led by the late TMT Project Scientist, Jerry Nelson. This process both reduces the cost of polishing and improves the smoothness of the resulting optical surfaces. Nelson’s revolutionary concept of segmented mirrors replacing a single large collecting aperture has been used worldwide for several large telescopes that cannot be created using a single optical element, including the James Webb Space Telescope. Founded in 1966, Coherent, Inc. one of the world’s leading providers of lasers and laser-based technology for scientific, commercial and industrial customers. Our common stock is listed on the Nasdaq Global Select Market and is part of the Russell 2000 and Standard & Poor’s MidCap 400 Index. For more information about Coherent, visit the company’s website at www.coherent.com for product and financial updates.